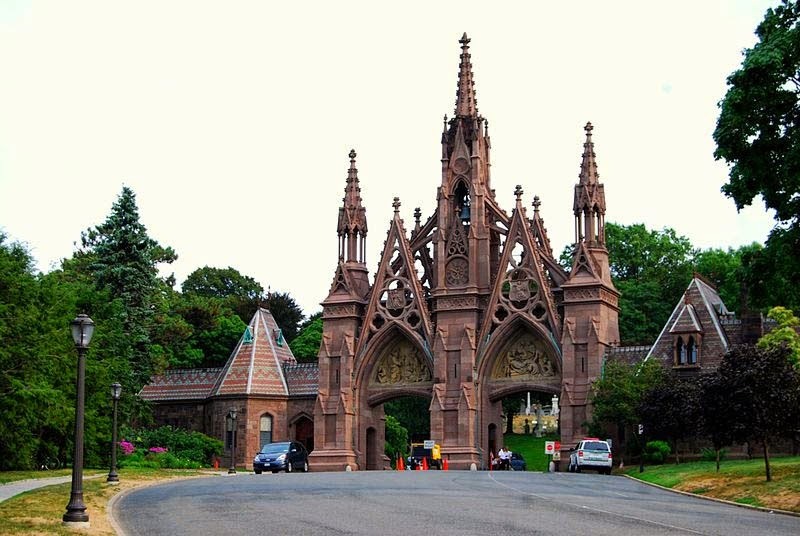 At the Green-Wood Cemetery Gates in Brooklyn, NY. The title of this post comes from that old song by The Smiths, “Cemetery Gates,” from the 1986 album The Queen Is Dead. Anybody else remember it? “A dreaded sunny day / So I meet you at the cemetery gates / Keats and Yeats are on your side / While Wilde is on mine” (Oh that Morrissey). 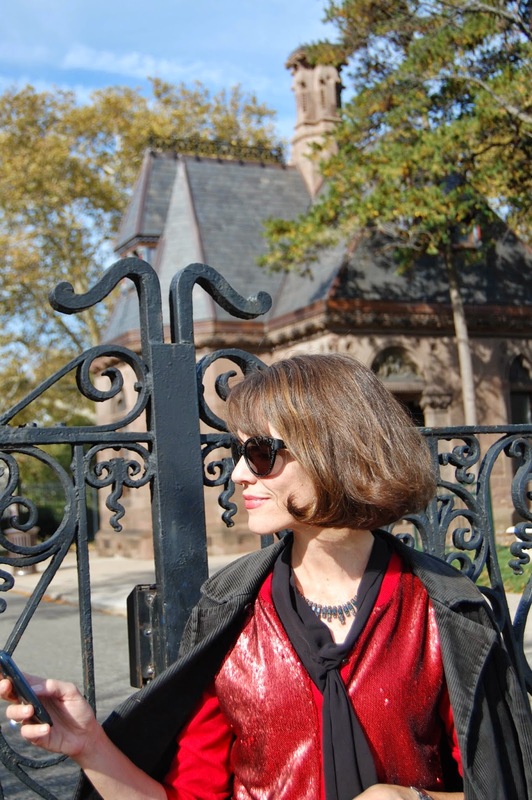 When my friend Gwynne and I met for pictures last fall for “How I Wear My: Leather, Crystal or Glass,” we ended up outside of Brooklyn’s historic Green-Wood Cemetery where I have spent a fair amount of time, either at the annual Memorial Day Concert, or lectures, even a party once (I tell you, there is nothing like having swanky cocktails in a gorgeous old cemetery). 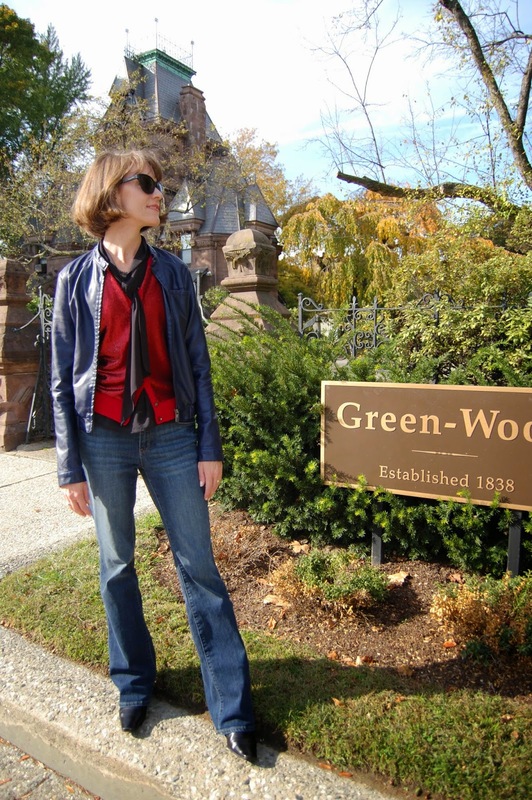 Green-Wood, established in 1838, is the final resting place of some famous New Yorkers, including the composer and conductor Leonard Bernstein, Louis Comfort Tiffany, famous for his beautiful stained glass work, and Juan Trippe, founder of Pan American World Airways. 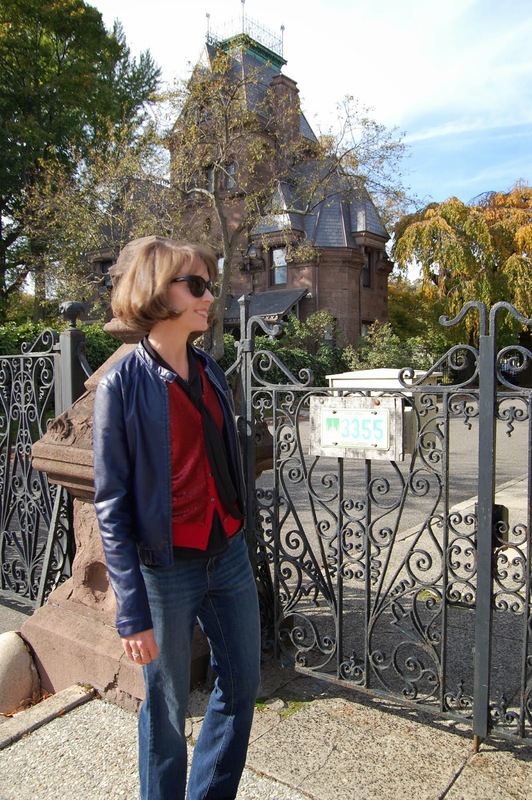 It is also is the burial site for the Hewitt sisters, Sarah and Eleanor, who founded the Cooper-Hewitt museum in Manhattan, were lovers of couture in the 19th century, and bought a lot of Charles Frederick Worth dresses on their trips to Paris. At their behest, their niece, Princess Viggo, bequeathed the collection to the Brooklyn Museum in 1931, and it is now owned by the Met. I feel personally indebted to those ladies for their generous gifts, which have given me so much happiness over the years when I get to see stunning Worth gowns at the city’s museums! Now that’s a cemetery gate! Photo by Paul Lowry. The second reason I decided to use these photos is because of the red sequined sweater, which is L’Wren Scott for Banana Republic. It is perfect for Valentine’s Day and you can consider this post my Valentine to you! I do adore a historical cemetery. I hope you enjoy a Valentine’s Day filled with fun and a lot of love! Thank you to anyone and everyone who stops by to read my little blog. I truly value and appreciate your friendship and lovely comments! The Last of the International Playboys likes that song too. ...btw GSL suspects that EJS has a new hairdresser on staff and do pass along our highest compliments! Love The Smiths, Morrissey and Johnny Marr! You should watch the Colbert Report clip with Morrissey, there is a classic funny moment within the interview. What a lovely cemetery. Happy VD, Jill! 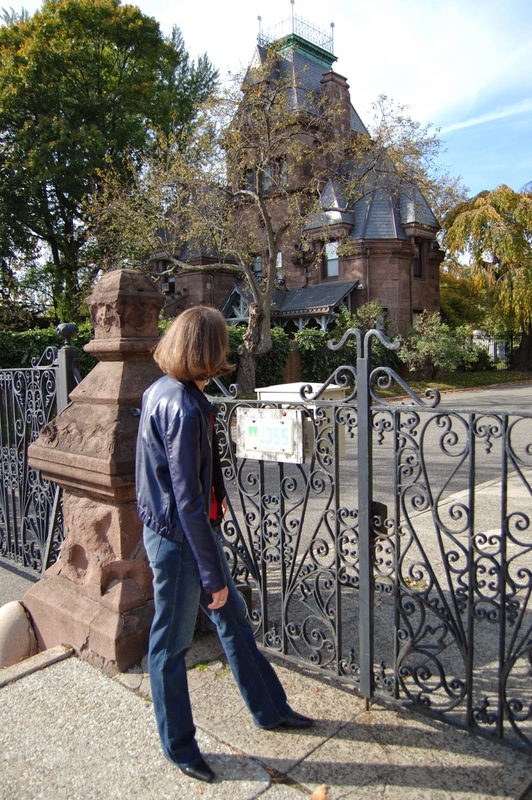 Hopefully I'll get over there from Seattle someday to see them, but until then, thank you for showing us the spectacular cemetery and gates. Looks like you're having a mild winter! Happy Valentines Day. Great post, Jill! Love the history information. Hi Helen, I will have to find that clip you mention. I hope Colbert got Morrissey to lighten up, I like his songwriting skills for sure but it seems in print he always takes himself so seriously! Hi Anon, thank you for stopping by! These pictures were taken last October, which is why it's still sunny and there's no snow on the ground. I wish it looked like this right now. It keeps snowing every other day and is absolutely freezing today. I could hang out at this place all day. How fun to read the old tombstones, etc. And I think a cocktail party there could be a blast. This is a fun cardigan. Makes an outfit so much more interesting than just a normal red cardigan. And if you like cemetry gates etc, you should see the one in Milan. It is the largest one in Europe. I was there three years ago and was amazed. Took loads of pictures. So nice when a cemetery is beautifully maintained.